Soil is a mix of varying amounts of inorganic matter, organic matter, water, and air. The chemical composition of the soil, the topography, and the presence of living organisms determines the quality of soil. In general, soil contains 40-45% inorganic matter, 5% organic matter, 25% water, and 25% air. In order to sustain plant life, the proper mix of air, water, minerals, and organic material is required. Humus, the organic material in soil, is composed of microorganisms (dead and alive) and decaying plants. The inorganic material of soil is composed of rock, which is broken down into small particles of sand (0.1 to 2 mm), silt (0.002 to 0.1 mm), and clay (less than 0.002 mm). Loam is a soil that is a mix sand, silt, and humus. Plants obtain inorganic elements from the soil, which serves as a natural medium for land plants. Soil is the outer, loose layer that covers the surface of Earth. Soil quality, a major determinant, along with climate, of plant distribution and growth, depends not only on the chemical composition of the soil, but also the topography (regional surface features) and the presence of living organisms. 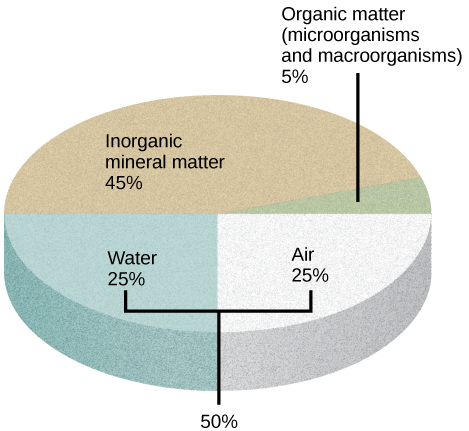 Components of soil: The four major components of soil are shown: inorganic minerals, organic matter, water, and air. The amount of each of the four major components of soil depends on the quantity of vegetation, soil compaction, and water present in the soil. A good, healthy soil has sufficient air, water, minerals, and organic material to promote and sustain plant life. The organic material of soil, called humus, is made up of microorganisms (dead and alive), and dead animals and plants in varying stages of decay. Humus improves soil structure, providing plants with water and minerals. The inorganic material of soil is composed of rock, slowly broken down into smaller particles that vary in size. Soil particles that are 0.1 to 2 mm in diameter are sand. Soil particles between 0.002 and 0.1 mm are called silt, and even smaller particles, less than 0.002 mm in diameter, are called clay. Some soils have no dominant particle size, containing a mixture of sand, silt, and humus; these soils are called loams. Soil formation is the result of a combination of five factors: parent material, climate, topography, biological factors, and time. Parent material is the organic and inorganic material from which soil is formed. Climate factors, such as temperature and wind, affect soil formation and its characteristics; the presence of moisture and nutrients is also needed to form a quality soil. Topography, or regional surface features, affects water runoff, which strips away parent material and affects plant growth (the steeper the soil, the more erosion takes place). The presence of microorganisms in soil creates pores and crevices; plants promote the presence of microorganisms and contribute to soil formation. Soil formation takes place over long periods of time. Soil formation is the consequence of a combination of biological, physical, and chemical processes. Soil should ideally contain 50 percent solid material and 50 percent pore space. About one-half of the pore space should contain water, while the other half should contain air. The organic component of soil serves as a cementing agent, returns nutrients to the plant, allows soil to store moisture, makes soil tillable for farming, and provides energy for soil microorganisms. Most soil microorganisms, bacteria, algae, or fungi, are dormant in dry soil, but become active once moisture is available. Soil distribution is not homogenous because its formation results in the production of layers; the vertical section of the layers of soil is called the soil profile. Within the soil profile, soil scientists define zones called horizons: a soil layer with distinct physical and chemical properties that differ from those of other layers. Five factors account for soil formation: parent material, climate, topography, biological factors, and time. The organic and inorganic material in which soils form is the parent material. Mineral soils form directly from the weathering of bedrock, the solid rock that lies beneath the soil; therefore, they have a similar composition to the original rock. Other soils form in materials that came from elsewhere, such as sand and glacial drift. Materials located in the depth of the soil are relatively unchanged compared with the deposited material. Sediments in rivers may have different characteristics, depending on whether the stream moves quickly or slowly. A fast-moving river could have sediments of rocks and sand, whereas a slow-moving river could have fine-textured material, such as clay. Soft sediment deformation: Soil distribution is not the same at all depths. The vertical section of soil layers is called the soil profile. The soil profile contains defined zones called horizons whicht have distinct physical and chemical properties that differ from those of other layers. An example is shown here in the soft sediment deformation in the Navajo Sandstone. Temperature, moisture, and wind cause different patterns of weathering, which affect soil characteristics. The presence of moisture and nutrients from weathering will also promote biological activity: a key component of a quality soil. Regional surface features (familiarly called “the lay of the land”) can have a major influence on the characteristics and fertility of a soil. Topography affects water runoff, which strips away parent material and affects plant growth. Steep soils are more prone to erosion and may be thinner than soils that are relatively flat or level. The presence of living organisms greatly affects soil formation and structure. Animals and microorganisms can produce pores and crevices. Plant roots can penetrate into crevices to produce more fragmentation. Plant secretions promote the development of microorganisms around the root in an area known as the rhizosphere. Additionally, leaves and other material that fall from plants decompose and contribute to soil composition. Soils are made up of combinations of four distinct layer types or horizons: O horizon, A horizon, B horizon, and C horizon. The O horizon, or topsoil, is made of decaying organisms and plant life; it is responsible for plant production. The A horizon is of a mixture of organic material and inorganic products of weathering; it is the beginning of true mineral soil. The B horizon, or subsoil, is a dense layer of mostly fine material that has been pushed down from the topsoil. The C horizon, or soil base, is located just above bedrock and is made of parent, organic, and inorganic material. 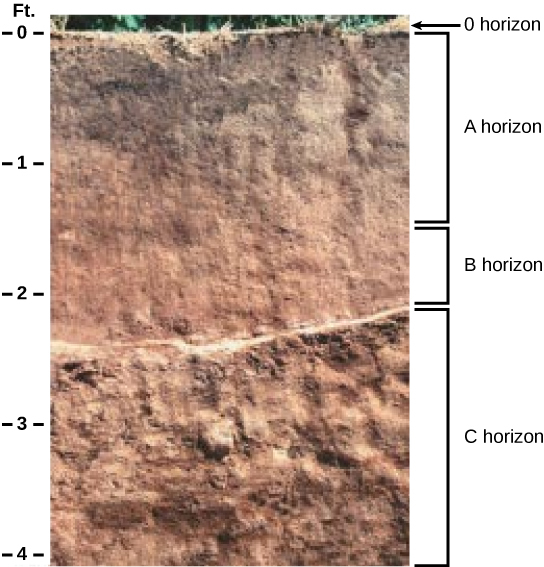 Soil profile: This soil profile shows the different soil layers (O horizon, A horizon, B horizon, and C horizon) found in typical soils. The O horizon has freshly-decomposing organic matter, humus, at its surface, with decomposed vegetation at its base. Humus enriches the soil with nutrients, enhancing soil moisture retention. Topsoil, the top layer of soil, is usually two to three inches deep, but this depth can vary considerably. For instance, river deltas, such as the Mississippi River delta, have deep layers of topsoil. Topsoil is rich in organic material. Microbial processes occur there; it is responsible for plant production. The A horizon consists of a mixture of organic material with inorganic products of weathering; it is the beginning of true mineral soil. This horizon is typically darkly colored because of the presence of organic matter. In this area, rainwater percolates through the soil and carries materials from the surface. The B horizon, or subsoil, is an accumulation of mostly fine material that has moved downward, resulting in a dense layer in the soil. In some soils, the B horizon contains nodules or a layer of calcium carbonate. The C horizon, or soil base, includes the parent material, plus the organic and inorganic material that is broken down to form soil. The parent material may be either created in its natural place or transported from elsewhere to its present location. Beneath the C horizon lies bedrock. 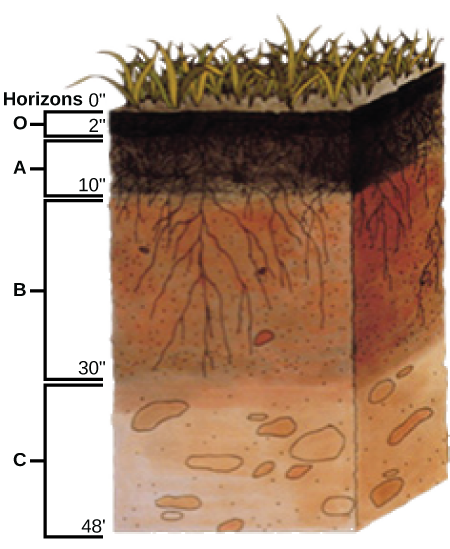 Some soils may have additional layers, or lack one of these layers. The thickness of the layers is also variable, depending on the factors that influence soil formation. In general, immature soils may have O, A, and C horizons, whereas mature soils may display all of these, plus additional layers. Mature soil: The San Joaquin soil is a mature soil that has an O horizon, A horizon, B horizon, and C horizon.